Leading-edge technology helps Charlotte sign shop improve product line & offer more services. Charlotte, NC – (August, 24, 2016) Heritage Custom Signs & Displays, a leading provider of specialty sign services, today announced the company has incorporated another high quality printer to its already impressive arsenal. 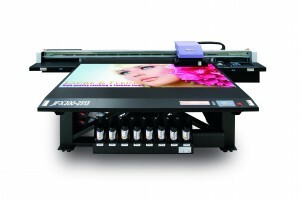 The Mimaki JFX200-2513 wide-format flatbed printer has the capability to print onto thick substrates, it offers the ability to produce a diverse range of prints. It is ideally suited for applications such as backlit displays, signs and posters, interior decor, glass and metal decorative panels and more. This addition will help the company provide more expedient signage options for their customers. With the ability to print on a variety of substrates including PVC, wood, vinyl, plastic, and more, the Mimaki 200 enables Heritage Custom Signs & Displays to easily and quickly print and process more signage orders. “The quality and speeds on the Mimaki line is unparalleled, it meets the high quality Heritage standards our customers are accustomed to.” said Thompson. “The addition of the 200 is another step in our continued growth. Heritage Custom Signs are a subsidiary of Heritage Printing & Graphics based out of Waldorf, Maryland and Charlotte, NC. With a staff of 12+ highly motivated individuals, equipped with leading edge technology, Heritage Custom Signs is positioned to serve the east coast with quality event and interior signage.